Luxury Contemporary Villa with own Pool, Sea and Beach Views, close to Lindos! Sleeps 6, 3 bedrooms. Licence to rent: MHTE 1476K92000401601. Villa Dimitra is a luxurious contemporary style villa overlooking Vliha Bay and features a new ensuite to the master bedroom and new main bathroom (or ensuite to 2nd bedroom) for the 2017 season. Owning a Greek property has always been our dream and we are delighted to be able to share this stunning villa with you. Imagine sitting on the terrace, cool drink in hand, looking across the infinity pool and out to sea, there is fresh fish cooking on the barbecue and the sun is shining, what could be better? The bedrooms and living room all have controlled air-conditioning for your comfort. The infinity pool and large terrace offer stunning views of Vliha Bay and are well equipped to enjoy outdoor living. I am an architect who runs a practice in the UK but has also renovated a series of houses over the years for our family. Having spent many holidays visiting the Greek islands, our ambition has always been to one day have a holiday home in Greece, so the first stage was to find a property near our favourite resort of Lindos, which luckily we did in 2007. We viewed Villa Dimitra when the construction had only just started in 2007, however, we were immediately taken by its position, having fantastic views overlooking Vlicha Bay to the east and the mountains to the west. The modern style of the property an open plan format were also exactly what we were looking for. Villa Dimitra is part of an exclusive group of 8 no villas overlooking Vlicha Bay. The property benefits from fantastic all round views with the outdoor spaces enjoying all day long sunlight. In addition, the villa's location is ideally situated only 5 mins drive from Lindos, and 5 mins walk to either the supermarket or the beach. The first floor master bedroom has a newly constructed ensuite, which is fully tiled with shower enclosure, wc and basin on granite vanity unit. There is a large first floor tiled family bathroom, complete with bath, shower over, wc, vanity basin and a washing machine. There is also a ground floor wc with basin and hand held shower head. 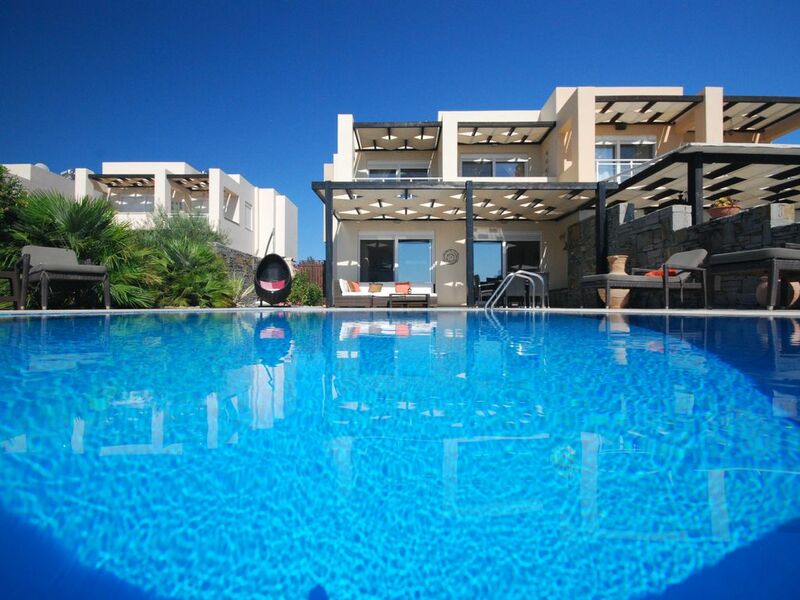 The Villa is a contemporary Greek style and fitted to a high standard. The kitchen has a ceramic hob, large fridge/freezer, microwave, toaster a wide array of utensils, crockery and pans. Traditional outdoor Greek barbecue. The rental of the villa is fully inclusive of air-conditioning, water and electricity. We will provide information about Rhodes and the villa on your arrival. For your reassurance we have a local Management Company, RPM, who will also provide a local emergency contact number. Please note, we ask you to respect our strict no smoking policy, to ensure all our guests can enjoy their holidays. Cot and highchair from Mothercare are provided. Beach towels are not provided, however, a mid week clean or welcome pack can be provided for a small additional costs. Long term rentals are price negotiable. Please note pool is in operation 1st April to 1st November each year. A beautiful villa set in beautiful location. The moment we arrived at Villa Dimitra we were not disappointed. It was late in the evening so the provisions that were kindly supplied were a welcome relief and so thoughtful. My children couldn’t wait to dive into the beautifully lit pool. The villa itself was spotlessly clean as too was the pool and patio area. The shaded area was a welcome relief to the midday sun. The local supermarket is well stocked and so we made good use of the bbq. Vlycha beach is only a 5 min drive down the hill and is a beautiful stoney beach which is very safe for the children. The water is beautiful and clear. If you can, hire a boat and go on an amazing tour of the beautiful coves and bays, drop anchor and snorkel, it’s incredible! Would highly recommend this villa and hope to return soon. Thank you for a wonderful holiday! We are really pleased to hear that you have had such a good holiday and enjoyed staying at Villa Dimitra. Vlycha Bay is also one of our favourite areas, since it never gets very busy and there are such a range of activities, served by good tavernas. We look forward to having the opportunity of welcoming you all back in the near future! Lovely villa, if you want a relaxing break away from it all then come here. The villa was lovely and immaculate with all the mod cons. The pool was the best feature which overlooked the bay at Kaytholos and my teenage boys just spent hours swimming and relaxing giving my wife and I a well earned break. The owners left a very helpful booklet that gave you all you need to know about the local area and ate out in Lindos every night sampling different restaurants all of which were lovely. Water sports were done on the beach which is a 15 minute walk away and then a beer in the local taverna overlooking the beach. There is a local supermarket to the villa which is a 5 minute walk away from the villa and has everything you need. All in all a great holiday I would definitely go back and recommend this villa - although be warned the weather and humidity in Lindos in July and August is hot !!! We are really pleased to hear that you all had a great holiday and enjoyed Villa Dimitra so much. Lindos is certainly a great place to eat out, but you would need a very long stay to get around all the restaurants! You are correct that it can get very hot during the main summer months, but at least at the villa you can either cool off in the pool or put the aircon on. We hope we have the opportunity of welcoming you all back in the near future! We're just back from a wonderful holiday at Villa Dimitra. Everything about our stay was spot-on: the accommodation easily catered for five of us (two adults and three teenagers) and had everything we needed. There is more than enough space for everyone to relax and spread out. The kitchen is well kitted out, the pool perfect for cooling off dips and the living room more than big enough. The outside furniture allows people to spread out too. The location is excellent - the beach is a 15-minute walk and lovely when you get there. We had a hire car (recommended) so it took five minutes to Lindos, 15 to Pefkos and we got to Kamiros Skala easily enough to get the ferry to Halki. Alan couldn't have been more helpful, there was a thoughtful welcome pack for our arrival and we relaxed the moment we walked through the door. It is great to hear that you have all had such a good holiday and enjoyed Villa Dimitra so much. Sounds like you also managed to visit a lot of the attractions on the island, which will have kept the teenagers occupied! I hope we have the opportunity of welcoming you back in the near future. Great! - a fantastic week in Rhodes. The villa was clean and tidy and had everything we needed – the pool was spotless – the sunbeds comfortable – the aircon good – the rooms spacious - the shower rooms modern and worked well - a spacious living area where we could escape from the heat - and a good sized fridge-freezer. Can’t fault anything! It was our first time in Rhodes – having done many other Greek islands – and we really enjoyed our week. Lindos, with it’s narrow, covered, maze of lanes and rooftop restaurants was spectacular. Lardos had several fantastic restaurants and a Friday ‘Greek’ night which was great too! Highly recommend this villa – Alan (the owner) was very responsive to communications and it all went smoothly. I'm really pleased to hear that you all had such a good holiday and enjoyed Villa Dimitra so much. You certainly seem to have visited most of the local attractions, which you will have found are easily accessible from the villa. The villa made this holiday for us. A fabulous week for recharging our batteries. It was a pleasure having you at the villa and I'm really pleased you had such a relaxing break. Hopefully the next time you need to recharge the batteries, we can welcome you back again! Fantastic family holiday wonderful villa . Everything you would expect and more. Location perfect for beach and beautiful Lindos just minutes away by car. Everything to hand , beautiful bathrooms and air conditioning perfect . The pool area is spacious with areas for relaxing , eating and sunbathing . Allan the villas owner went out of his way to help on 2 different occasions which was greatly appreciated. Overall would highly recommend this beautiful villa and Rhodes . A beautiful island . We are really pleased you enjoyed your time at Villa Dimitra as well as the local attractions. We look forward to welcoming you back in the near fututre! Villa Dimitra is located 7 minutes by bus or taxi, from Lindos Village, which is a World Heritage site, with whitewashed buildings and narrow cobble streets packed with traditional tavernas, restaurants, shops and bars, many of which are roof top with stunning views. Here you will find cash points, local butchers and bakers. There is a large supermarket on the main coast road approximately 500m from the villa, which has fresh bread daily, a butchers counter.They stock almost everything you might need. Further along the road there is a small village called Kalathos with has a baker, a chemist and the nearest petrol station. Villa Dimitra is a great base to explore the island of Rhodes, with secret coves, beaches, mountain villages and historic Rhodes Town with amazing shopping. There are golf courses, a water park, snorkelling adventures and trips to nearby islands. Couples worldwide choose to marry in a picturesque beach side church in St. Paul's Bay, which is just 10 minutes drive from the villa. What better place to honeymoon than in a romantic villa. Bookings made within 55 days of date of arrival are payable in full at time of booking, including £200 refundable damages / security deposit.